Think outside the box when combining ingredients. 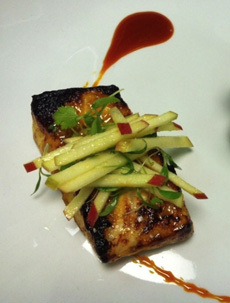 That’s what Executive Chef Leo Forneas of Silk Rd Tavern did, topping a crispy fish fillet with julienned apples. He chose red-skinned apples to add a touch of color. You can use raw apples or lightly sauté the strips in butter or oil. You can cook the apples in advance so as soon as the fish comes off the grill/out of the pan, you’re ready to roll. You can also add a bit of allspice, cinnamon or nutmeg to the apples for another layer of flavor. While the crunchy apples nicely accessorize the crispy skin of the fish, you can use them to garnish any grilled or sautéed fish. You can also build on the idea, adding slivered almonds, blueberries or raisins/dried berries. Fish with apples: It makes you smart while keeping the doctor away. Photo courtesy Photo courtesy Silk Rd Tavern. Julienne strips resemble small matchsticks, typically 1/16-1/18 inch wide and 1 to 2 inches long. To cut julienne strips, first cut the vegetable into 1/16 or 1/8-inch-thick slices, then stack the slices and cut them into 1/16 or 1/8-inch-wide strips that are of the desired length. Batons (sometimes called batonnets) are larger matchsticks, typically 1/4 x 1/4 x 2 to 2 1/2 inches long. Use the same method as with julienne strips. Find more of our favorite fish recipes.